How can the Pyrenees tackle climate change? 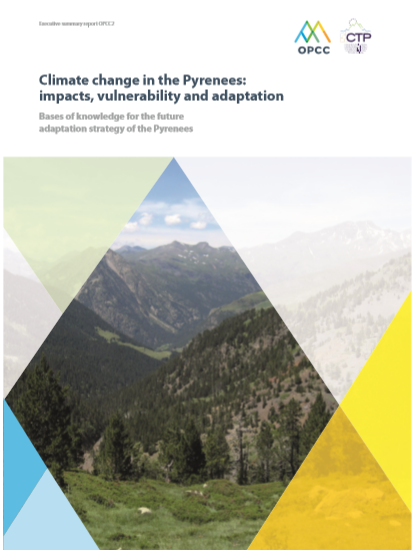 The Pyrenees Climate Change Observatory (OPCC) published its new report “Climate change in the Pyrenees: impacts, vulnerabilities and adaptation”. Its production gathered more than 100 experts from Aragon, Navarre, Catalonia, Basque Country, Nouvelle-Aquitaine, Occitanie and Andorra, which represents a broad scientific consensus for the Pyrenean territory. Over the two last years, they conducted researches under the coordination of the OPCC and presented their results during the Conference on Natural Risks and Climate on 12 and 13 November 2018 in Zaragoza. This report aims to update scientific knowledge on climate change impacts in the Pyrenees, to identify the main challenges for the territory and to provide guidance for public policies based on scientific evidences. Outcomes of the report show critical impacts of climate change for the Pyrenean mountains. Over the last 50 years, “the average temperature in the Pyrenees has increased by 30% more (1.2°C) than the world average (0.85°C)”. Since the 1980s, half of the glaciers of the Pyrenees have already disappeared. Overall, the report shows a clear increase in temperatures, by 0,2°C per decade since the 1980s, the last decade being the hottest one in the existing records. The constant rise of temperatures coupled with the variation of precipitations will also affect the specific Pyrenean fauna and flora, while this territory is identified as a major hot spot of the European biodiversity. In mountain areas, climate is indeed the main ecosystems regulator and even the smallest temperature variations can affect the various species. This complete report on climate change impacts does not only flag the important consequences on fauna, flora, water resources and forests but also outlines the repercussions on the socio-economic life of the Pyrenean populations. Not only they will observe a landscape alteration but also suffer from more natural risks. Moreover, mountains economic activities might suffer from potential collateral consequences since snow tourism represents 15% of Andora’s GDP for instance while agriculture and pastoralism, commonly spread in the Pyrenees, may face a decrease of production and a loss of agricultural lands. Experiment and publicize different models of adaptive forest management to increase the resilience of forests in the face of repeated and / or extreme adverse climatic events. Both the report and recommendations were presented by scientists during the OPCC2 conference on climate change and natural risks in Zaragoza. More than 100 Spanish, French and Andorran experts and policy-makers attended the event to discuss the challenges of climate change in the region. Representatives from the Basque Government, the Government of Andorra the Pyrénées-Atlantiques Department also shared their experience on risk management and security measures to implement. Euromontana regularly works with the OPCC on mountains and climate issues. In 2016, the OPCC participated to the X° European Mountain in Bragança on Mountains’ vulnerability to climate change where they presented their organisation’s work on the Pyrenees. Read the full declaration « Face the challenge of climate change: adaptation for future generations » and good practices on how to adapt and mitigate climate change in mountain areas.